Two high frame rate cameras monitor the region of interest. Once the object (e.g., ball) enters the region, it is located. Two or more consecutive time-stamped locations are used in order to extract other metrics. The main components of the system consist of two high frame rate cameras, a software that exploits mobiXeyes machine vision algorithms, a text-to-speech engine. 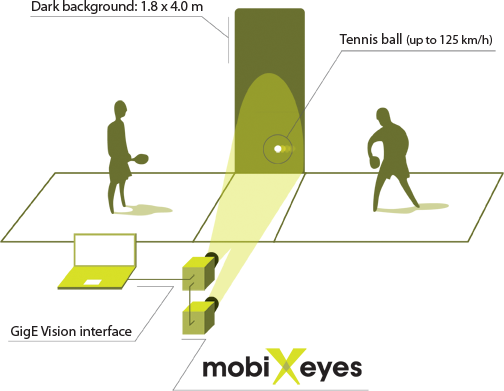 mobiXeyes hardware ships as an integrated aluminum box with all electronics included. You just have to plug it to a power supply and connect it to a computer running the software through a Gigabit Ethernet port. Why not use a radar like those used in tennis? Radars, based on the Doppler principle, have inherent cosine error that prevents them from accurately measuring an object’s speed. In addition, they can be jammed, and they cannot provide location of the object, just speed. Default software calculates ball speed and all statistics related to a hit. It has full support for tournament setup (scoreboard, game sheets, team management etc.). Custom software can be developed based on your specific needs!